How the games that are played during the regular season can change the field of 16 in a matter of moments. If you think last weeks field of 16 had some great games, this weeks field of 16 has even better games and rematches. This mock field of 16 for a future college football playoff format, is what the media won’t speak about yet, but internally want this more than ever. I believe that their are a group of college football coaches at the FBS level who would embrace the college football playoff being expanded. Their thoughts are concurrent with mine. 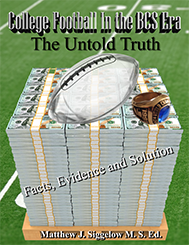 However, my research in my book supports and proves that an expanded field of 16 can be implimented into the FBS level of college football, under the NCAA blue logo, allowing all FBS football programs equal, fair and just opportunity to compete for the National Championship and exponentially generate more revenue for the college athletics. This field is well represented by ALL Power Five Conference, Independents and three (3) of the Group of Five Conferenes. The Pac 12 and AAC earned three (3) berths, the SEC, ACC, and the Big 12 earned two (2) berths, and the Big 10, the MAC, the MWC and Notre Dame earned one (1) berth. This is what could be and possibly will be in the future. Please rememebr, each week this will change until the FINAL FIELD of 16. Each week prior to the final Mock 2017 Field of 16 for college football I will post a new bracket. Once any FBS program earns at least a berth into my Field of 16, but not the exact seeding placement; I will place them in BOLD. This will notify anyone who reads this blog post that, that FBS program has earned a berth to my field of 16. If you plan in using any of my ideas, thoughts or ranking to disucss publically in print, web based media postings or on air debates either in television or radio; please adhere to the APA/MLA polocies and procedures when citing sources.